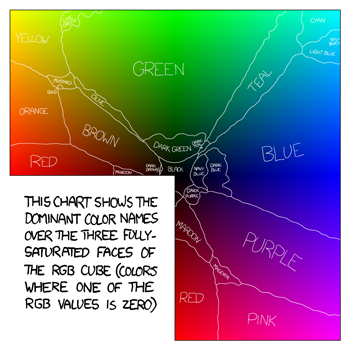 I just spent five or so minutes reading Randall Munroe’s fascinating blog entry about the colour survey he recently ran. Randall writes and draws XKCD, “A webcomic of romance, sarcasm, math, and language,” which is a pretty popular amongst geeks. Randall’s survey is a great reminder that your community, whether internal or external, are an amazing source of information that you can easily tap into. Services like Poll Daddy or Survey Monkey let you ask questions of your community, through which you could potentially be learning a lot about your business, your community’s needs, topics of interest… possible areas of enquiry are limited only by your imagination. Well, in truth, you are limited by your imagination, your relationship with your community, and its size. There’s no getting away from the fact that if you have a tiny community, you won’t get a big enough response for the results of your survey to be meaningful. Equally, if your relationship with your community is poor, they won’t feel inclined to take the time to answer your questions. But if your survey answers questions they have themselves, taps into a vein of curiosity or, as in the case of Randall’s colour survey, provides a novel way of procrastinating, then you are much more likely to see success. It’s worth having a think before you put any survey together on how best to do it. You have to get it right first time, because you can’t run the same survey twice and expect people to engage the second time round. I have learnt the hard way that you can read and read and read your questions over and over, and there will still be errors. So make sure you have time to do some test runs with friends and colleagues so that you can locate and fix errors. I’d also say that it’s important to understand how you’re going to analyse the answers before you formulate the questions. Services like Survey Monkey allow you to automatically create graphs to visualise your data, but if you get your questions wrong, the graphs won’t save you. There’s so much potential for businesses who enter into dialogue with their customers and staff, and surveys/polls are just one way to realise some of that value. It just surprises me that more businesses aren’t nurturing their communities and collaborating with them to gather useful information that both parties can then benefit from.